International Journal of Research in Health Sciences,2016,4,4,81-87. 1,2Assistant Professor, 3Professor & Head, 4Associate Professor, 5Professor, Department of Pathology, Bhaskar Medical College, Yenkapally(V), Moinabad(M), Rangareddy district, Telangana-500075, INDIA. Introduction: Soft tissue can be defined as non-epithelial extra-skeletal tissue of the body and is represented by the voluntary muscles, fat, and fibrous tissue, along with the vessels serving these tissues & the peripheral nervous system. The understanding of neoplasms of soft tissue has increased significantly, both from a histopathological and genetic point of view. Objectives: 1. To study the clinic-pathological spectrum of soft tissue tumours received in a tertiary care centre in telangana. 2. To analyse the frequency of various soft tissue tumours in rural area of Telangana. Materials and Methods: The present study included 104 cases of soft tissue tumours. Demographic parameters were analysed & spectrum of histopathological diversity was analysed. Results: Benign tumours constituted 88% of the cases. Lipomatous tumours were the most common histological type (47%) followed by vascular tumours (17%). Trunk was the most common site of malignant soft tissue tumours. Conclusion: Malignant tumours constituted only 12% of soft tissue tumours. Lipomatous tumours were the predominant histologic subtype. 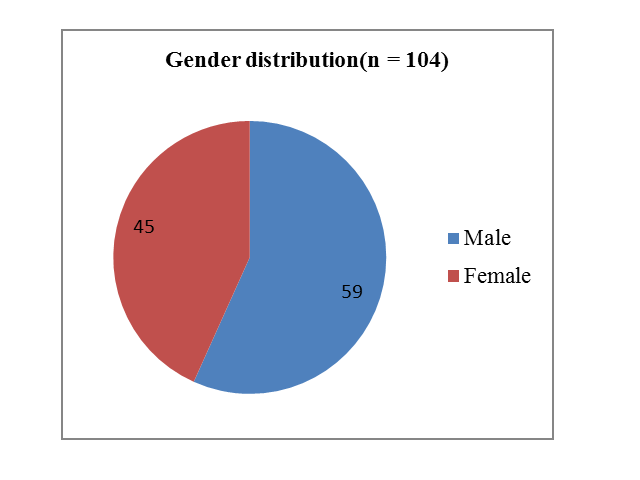 Gender distribution of soft tissue tumours(n = 104).